Étude Daussy-Riqles, Art Islamique, Paris 1990. Auction catalogue February 1990. Soft cover 24 x 18 cm. 72 pages with 77 lots. CHRISTIE'S, Oriental Rugs and Carpets, London 2005. Auction catalogue 13 October, 2005[sale:7078]. Soft cover 27 x 21 cm. 175 pages with 230 lots. "Rugs and Carpets from Persia, North India and Afghanistan." CHRISTIE'S, Orientalist Art, New York 2006. Auction catalogue 19 April 2006[sale: 1774]. Soft cover 27 x 21 cm. 124 pages with 76 lots. Lot 74: David Roberts, Ruins of the Great Temple of Karnak. Niewöhner, E., Der Sultan im Bade. Bilder und Objekte höfischen Lebens in Islam, Hannover 1995. Soft cover 22,5 x 21 cm. 203 pages with 114 illustrations. Text in German. Ex library copy with usual markings. FREMBGEN, J. W., Derwische und Zuckerbäcker. Bilder aus einem orientalischen Bazar, München 1996. Soft cover 22 x 22 cm. 118 pages with aroun 70 illustrations of market vocations and professions.Ex library copy with the usual markings. Good copy. Text in German. BRIANZA, N.G. & STAEHLIN, E.[eds], Höhenflug und Absturz. Wilhelm Dieudonné Stieler(1888-1912) Ägyptenreisender, Sammler und Luftfahrtpionier, Basel 2006. Ein Katalog der Stiftung für ein schweizerischen Orient-Museum. Soft cover 24 x 24 cm. 147 pages with 48 illustrations. Good copy. BEHRENS-ABOUSEIF, D., Islamic architecture in Cairo. An introduction, Cairo 1989(publisher: The American University in Cairo Press // ISBN: 9774242033). Soft cover 27 x 21 cm. 173 pages with 132 illustrations. Good copy. SAFADI, Y.H., Islamic Calligraphy, London 1978. Soft cover 27,5 x 20 cm. 144 pages with 200 illustrations. Boukabouya, I., L'Islam dans L'Armée francaise, Lausanne 1917. Soft cover 23,5 x 16 cm. 75 pages uncut. 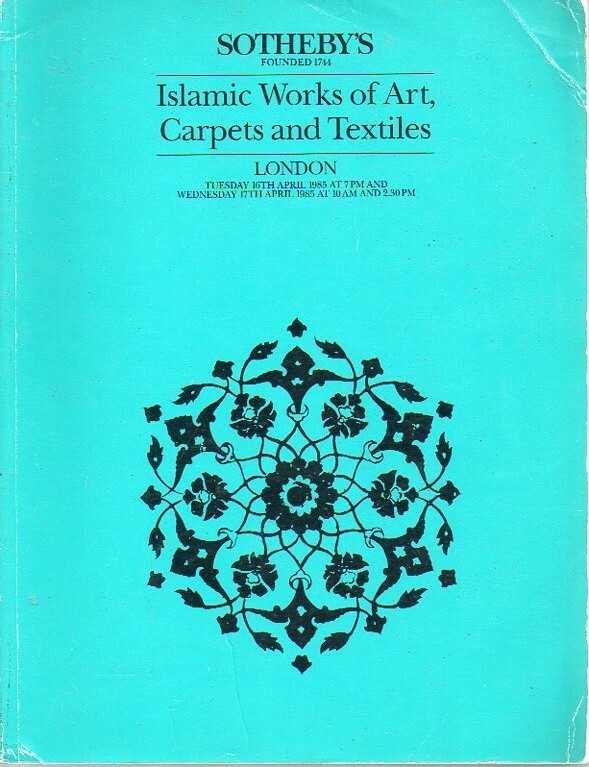 Sotheby's, Islamic Works of Art Carpets and Textiles, London 1985. Auction catalogue[sale 16th/17th April, 1985] 27 x 21 cm. unpaginated 853 lots. Cover some wear and tear(see photograph). Content good. SOTHEBY'S, Arts of the Islamic World, London 2003. Auction catalogue 30 April 2003. Soft cover 27 x 21 cm. 151 pages with 166 lots. SOTHEBY'S, Arts of the Islamic World, London 2000. Auction catalogue 12 October 2000. Soft cover 27 x 21 cm. 208 pages with 221 lots. SOTHEBY'S, Arts of the Islamic World, London 2001. Auction catalogue 18 October 2001. Soft cover 27 x 21 cm. 177 pages with 195 lots. SOTHEBY'S, Arts of the Islamic World, London 2003. Auction catalogue 15 October 2003. Soft cover 27 x 21 cm. 108 pages with 99 lots.